Mission Control is the excellent window management utility in OS X that lets you get a quick overview of everything you have open. 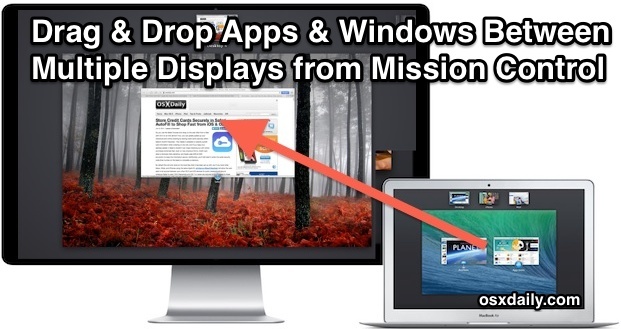 While Mission Control has always been able to drag windows and apps between different virtual desktop Spaces, a new ability has been added to modern versions of OS X that allows Mac users with multiple monitor setups to gain the same drag & drop support between external displays too. While you don’t need multiple screens to use the basic drag & drop between Spaces feature, but we’re focusing on that multi-screen setup usage here. This greatly improves multi-display window management and organization, and it makes it easier than ever to reassign apps and all their windows to another display, move an entire Desktop space to a different screen, or just send a single app window to another display if you’d prefer to do that too. Using this trick when screens are overwhelmed with too many open apps or windows can be a lifesaver, quickly restoring productivity without having to close or quit everything or spend too long reconfiguring windows and desktops. This works regardless of how many screens you have connected to the Mac, whether it’s two, three, or many. While this specific trick is limited to Macs using more than one display, you can also drag and drop apps, Desktops, Dashboard, and windows between virtual desktops on a single screen setup from the Mission Control window as well. Note that app icons only appear in Mission Control when you have “group windows by application” selected in the Mission Control Preference Pane. This should be mentioned in the article. It is possible to move only non-active Desktop Spaces between screens – trying to move an active Space will hit the edge of the screen and won’t let go any further. Before moving, switch to another Space first. Is there a way to move apps between workspaces (or monitors) using only the keyboard? On Linux, if I press CTRL+Shift+Arrow , I can move apps between workspaces. Until now, I haven’t found a way to do it on Mac.